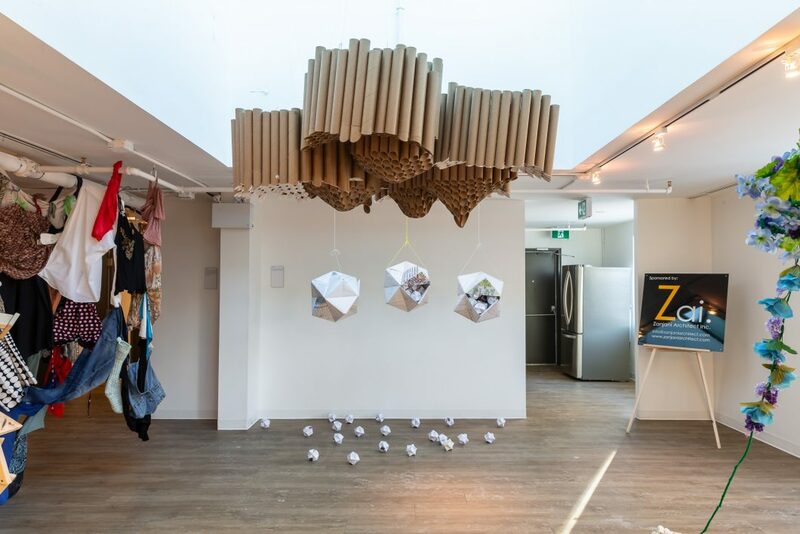 We spoke with Rotem Yaniv, Director of PULP: Reclaimed Materials Art and Design, on how his team of artist have brought recycled materials to life at the Delisle Space (1 Delisle Ave) for PULP: Exhibit + Home. Can you describe PULP and why you wanted to get involved with DesignTO at Yonge + St. Clair? PULP: Reclaimed Materials Art and Design is a Toronto based not-for-profit corporation set to encourage community building and environmental awareness. In the fall of 2018, PULP, The Delisle Space, and Yonge + St. Clair began collaborating on PULP : art party and its continuing exhibit during DesignTO. We were very excited to work with a beautiful venue just across the street from a subway station. We were thrilled to be part of the artistic expression happening at Yonge + St. Clair, pieces like Equilibrium and the Tunnel of Glam , and now PULP: Exhibit + Home, in collaboration with At Odds Collective. Can you describe the installations and how they came about? All of the installations at PULP : Exhibit + Home are made completely or mostly of reclaimed materials – printed paper, discarded cardboard, old cloths, or reclaimed wood. There are more than ten installations so I’ll only get into a few. We have Ripple Effect by Natalia Bakaeva (creator of Equilibrium) and Xiao Sunny Li which is a hung piece made of dozens of cardboard tubes gathered at architecture offices and printing shops, cut into an interesting doubly curved surface. It is quite interesting to look at the installation from different places as the hollow tubes create optic effects. 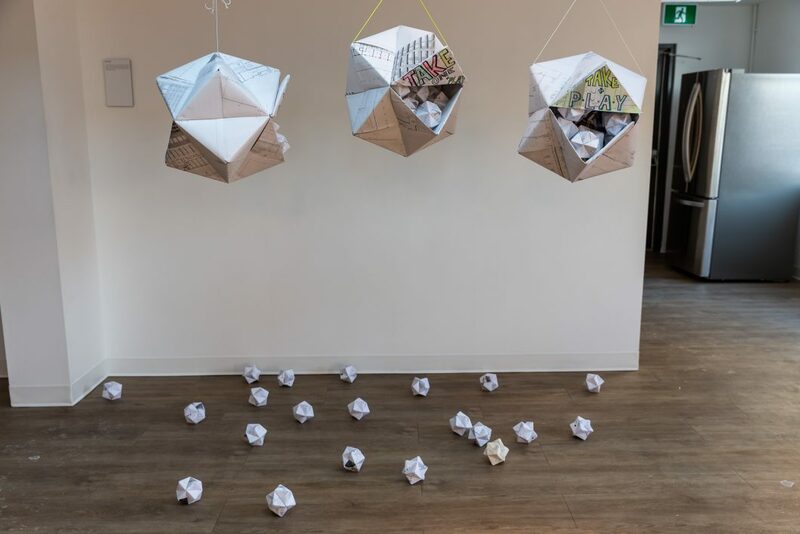 Another piece is Sky-scrapper by Daemon K Retren and Hillary Predko which consists of Pre-cut and drilled geometric shapes made of scrap wood are provided for a playful sandbox experience. Guests at the exhibit are encouraged to take existing constructions apart and create their own. Then there is Fated Forest by Alisha Sunderji and Brianna Smrke (A_B Collective). 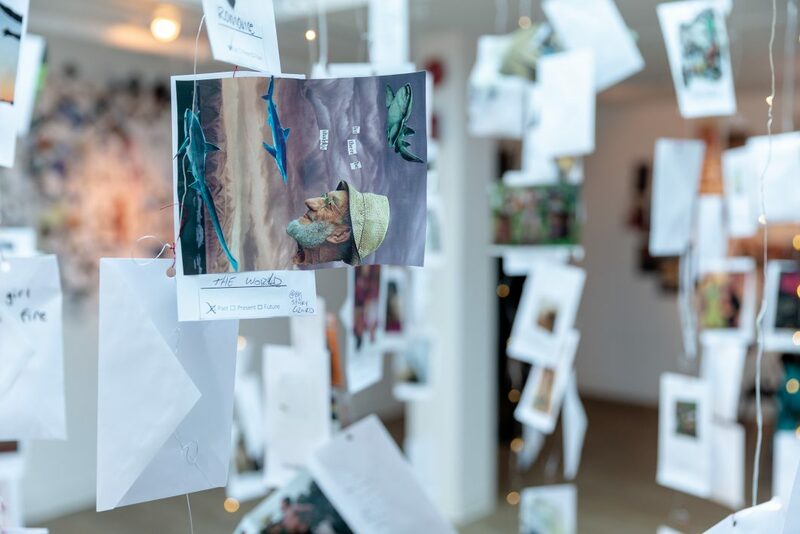 This piece invites participants to sift through old National Geographic magazines and add to a hanging, kaleidoscopic forest of mini-collages. Each floating leaf in the forest will capture different views of the past, present or future of someone’s life or the state of the world. 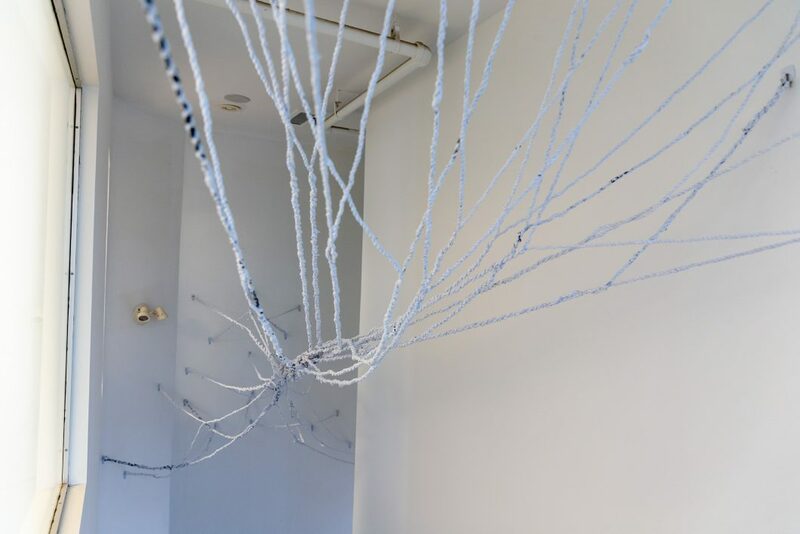 Guests entering The Delisle Space will pass through Ksenija Spasic’s jelly fish made of old tomato cages and printed mylar, followed by paper ropes woven by Mona Dai and Evan Brock and hung above the stairs. Before and during the exhibit, At Odds Collective will be at the space creating sculptures out of reused materials which represent how we build ourselves up in the present using pieces of our past : a survivor sewing themselves back together after having dissolved into a storm of flowers; a lonely lover made of past love letters; a traveller made into a library of past treasures; a bowing child holding up a new knick knack to be taken by the person viewing the piece, always replaced by another collected piece to lose.The PULP exhibit will slowly get populated with little sculptures engaging with the installations. At Odds Collective is made of Enrique Gaudite, krivvy, Natascha Malta, and Sylvia Thorn. What do you hope visitors take away from the experience? Reclaimed materials art or found objects art is different from other forms of art which utilize off the shelf media. An artist working with reclaimed materials cannot create anything they desire, they must translate the existing object into a new form or use and inject it with new meaning. At PULP, we add an additional complication – paper and plastic based materials must remain recycleable at the end of the exhibit and we discourage the use of glue and oil paints or glitter on such materials. I hope guests will entertain these concepts of translation as I believe they are key to the development of sustainable commodities manufacture and reuse. PULP : Exhibit + Home simply shows the value embedded in so many materials Canadian society labels as unwanted.